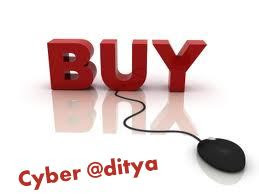 cyberaditya: About Online shopping ?? In recent times we have all become so used to the idea of online shopping that to some of us, it’s hard to remember when it wasn’t around. The internet has transformed many aspects of life, but one that has really been changed is how we shop for goods and services. Sure it is great to go into a store and we all know that the ladies, especially, love to spend hours walking around shopping malls, but the convenience and time saving factor just can’t be beaten. It all started in 1979 Well that obviously means before internet’, Michael Aldrich invented online shopping that allowed electronic transactions. From then on, we saw small improvements, but it wasn’t until the World Wide Web was created in 1990, that we really saw e-commerce come into its own. In the 90’s, we saw the Dot-Com bubble with big guns like eBay, Amazon and Google entering the game. We all know, however, that in 2000, that bubble burst and many of these companies were affected and put off by what had happened. However, in recent years, we have seen that same internet market explode. If we just take a look at the stats, 83% of North Americans say they have shopped online, while 87% of people from Asia and Australasia have shopped online. The figures are generally this high the world over. Only in Africa and the Middle East do the figures sit around only 53%. If we look at the top five things that are purchased online, we will see books (with 44% of people having this at the top of their list), then clothing, airline tickets (sales of which are growing at a considerable rate), electronic equipment and hotel reservations. The most active audience is not North America, it is the Asian Pacific, with South America coming in second. With the growth of mobile marketing, we have also seen a boom in mobile commerce. With smart devices and tablets, individuals are able to shop from anywhere. movies, music and games are purchased the most through mobile devices, primarily through the use of Blackberry's and iPhones. It is predicted that by 2015, e-commerce sales will reach $119 billion via mobile and a staggering $1.4 trillion online. Lately, we have seen Groupon go public and further increase online shopping’s reach. Now buying a dinner for two or a spa day is as easy as a click. We are able to buy music off iTunes, Google Music and Amazon, and series and movies are available from the same providers. We can book a movie, a plane ticket, reserve a table at our favourite restaurant and buy just about anything you can think of. Ecommerce continues to evolve through group buying (Groupon, CityAds etc), there is mobile commerce and now and social commerce that we have seen Facebook taking big strides in lately. The growth of online shopping is staggering and considering marketing trends, I don’t see the growth slowing down anytime soon. like and share this on facebook. You are right at this time about online shopping, I read full and know some most important factors about online shopping..